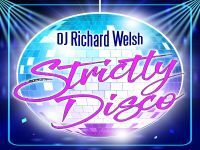 "Richard Welsh - DJ / Entertainer"
Mobile disco entertainment for wedding receptions, birthdays, corporate and any other party / celebration - we know that you want your party to be a memorable occasion - an event that's special, be it a birthday party, wedding anniversary, corporate event or other occasion. You can be assured that our DJ/host is experienced, professional, reliable, smart and approachable. He knows how to play the right music for your special night. Richard Welsh has over 30 years' experience in the disco / entertainment industry. Before moving to the south coast he had a very successful career in London as a club DJ where he had the pleasure of working alongside radio DJs, pop stars and TV personalities. Richard has also toured clubs and holiday resorts across the UK and Europe. Richard is a talented DJ and will use all of his experience to help you ensure your event is a big success from start to finish. His lively and enthusiastic approach to your special day will likely make it memorable for you, your family and guests. Richard always uses professional-grade sound and lighting equipment. Why not try a theme party? Everybody loves dressing up and getting into the mood of the party theme! Why not add karaoke to your event with a handful of microphones, TV screens etc. Required by many venues, Strictly Disco has a current PLI policy with DJGuard / in the amount of £5 million. Also required by many venues, Strictly Disco has supplied satisfactory evidence of holding current PAT inspections of their equipment dated within the last 12 months. A Method Statement outlining Strictly Disco&apos;s Health & Safety procedure for setting up disco equipment has been provided. Strictly Disco has provided Risk Assessments undertaken at events sourced via needadisco.com, indicating that they can undertake these competently. Why do people choose to book Strictly Disco? Difficult choice in the end so did a spreadsheet of benefits and matches, they came out top. "I was extremely pleased with Richard and very happy with all aspects of our party/evening.I thought he was friendly,presentable and very professional and I have had only good feedback .He suited us really well and his interaction was particularly enjoyed. [Admin note: feedback earned under previous identity Party Nights Out]"
"Very glad to have Richard at our event, there was a lot to fit in & he kept everything on track! [Admin note: feedback earned under previous identity Party Nights Out]"
"Thank you for your review! It was a great evening and very glad to hear that everything went to plan!" "Arranging things with Party Nights Out was easy and both Cheryl and Richard were very proactive and helpful. Before and during the party, Richard checked on music choices, contacted the venue and provided the certification needed. Richard was excellent on the night, reading the audience and taking account of their needs. He also adjusted lighting during the time a friend of mine was present that suffers from epilepsy and then back to normal disco lighting later. All in all, Richard was brilliant and I have no hesitation in recommending him. Thanks Richard and Cheryl, you made all the difference to my party. [Admin note: feedback earned under previous identity Party Nights Out]"
"A huge thank you for the lovely feedback. It was a great evening with your lovely family and friends.Look forward to seeing you all again at another event. Take care Richard and Cheryl"
"I cannot recommend Richard more highly enough. The UV set-up and music choices were second to none and he was the perfect DJ for a mixed group of 11-15 year olds! [Admin note: feedback earned under previous identity Party Nights Out]"
"Richard was a brilliant DJ and I would recommend him highly. [Admin note: feedback earned under previous identity Party Nights Out]"
"Richard was in a word Perfect!! My girls couldn't have asked for a better DJ for their party. Richard was engaging, enthusiastic and able to control a room full of under 11's. The music and games could not have been more suitable and apparently their party was the talk of the school the following week. I could not have been happier with the service and value for money, Richard is a real star and I would not hesitate to book him again in the future. Can't be more thankful for a thoroughly enjoyable afternoon :-) :-) [Admin note: feedback earned under previous identity Party Nights Out]"
"I would highly recommend Richard. Nothing was too much trouble and he was very welcoming to all the guests. The music I requested was played and he also took requests on the night. An excellent DJ!!!! [Admin note: feedback earned under previous identity Party Nights Out]"
"Richard was great, personable and creative on the evening - would happily recommend [Admin note: feedback earned under previous identity Party Nights Out]"
"Brilliant. Richard was very professional. He arrived early, was very friendly and polite, was well dressed and did a fabulous job of keeping everyone entertained all night. [Admin note: feedback earned under previous identity Party Nights Out]"
"Richard provided a fantastic party for our wedding. He was patient between the speeches and the start of the dancing and once the music was playing the guests never left the dance floor. Thank you for a fantastic party. [Admin note: feedback earned under previous identity Party Nights Out]"
"Richard was a fantastic DJ for this event. Very professional, communicated well from the offset and made the whole party stress free. I would definitely recommend him. [Admin note: feedback earned under previous identity Party Nights Out]"
"Brill night. Very professional , friendly and interactive. Highly recommend [Admin note: feedback earned under previous identity Party Nights Out]"
"Richard Welsh was the perfect DJ with the perfect equipment and music. Our two 14-year old birthday girls and all their guests had a brilliant evening. Could not have gone any better. Would recommend Richard to any one! [Admin note: feedback earned under previous identity Party Nights Out]"
"Richard was extremely friendly and informative during our initial conversation. He kept in contact with me leading up to the event ensuring that everything was ok. He contacted the venue in advance to discuss entry etc to set up. During the event he was Fantastic. He incorporated our music choices excellently, even incorporating a theme of ;songs from films; throughout the evening. I would definitely recommend Richard to my friends. [Admin note: feedback earned under previous identity Party Nights Out]"
Get FREE no-obligation disco quotes from Strictly Disco and other DJs covering your venue. Take 2 minutes to fill in some basic details and we'll do the rest! If you are contacting Strictly Disco about an event, it's always a good idea to include the DATE, LOCATION, EVENT TYPE, AGE GROUP and TIMINGS to speed things up!